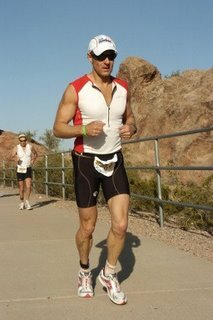 In 10 Ironman distance triathlons, I have yet to experience a flat tire on the bike course, so I was not all that surprised when I heard the terrifying “psssssstt” sound coming from below me as I was half way through a sub five hour bike split at Ironman Arizona 2007. As if a premonition of something that I needed to prepare for, when I left the bike store that installed my tubular tires, I asked the cranky bike mechanic if he glued the area of the tire at the opposite end of the valve so I could remove the tire if I flatted and he launched into this “there’s a thing called liability insurance you know, and…..” bla bla bla…. to which I replied; “Sorry, I should have asked you to leave an inch or two unglued so that I could remove the tire if I flat during the race – my bad, I forgot”. He told me that he wouldn’t have done it anyhow due to the previously noted liability issues. I always glue my own tires – I was just real busy and thought I could get a ‘pro’ to do it this time. Lesson learned. 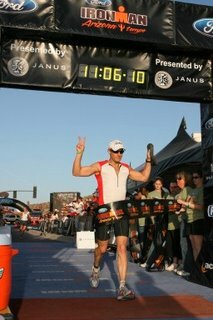 So anyhow, there I was, around the half way point on the 112 mile Ironman Arizona 2007 bike course with a potential personal best sub 5 hour bike time when I had to pull off the road to fix my first flat during a race. My sub 10 dream vanished as quickly as the air vacated from my rear tire. I wasted no time pulling the wheel off and preparing my spare tubular. If I could limit the fix time to less than 5 minutes, I just might be able to hammer hard enough to make back the time. The famous B-line highway in Tempe cuts through a beautiful natural desert setting featuring a brilliant red hue in the rock from iron oxide, rich hematite deposits and smashed beer bottle glass. The last ingredient was probably responsible for cutting up my right knee as I knelt down on the unpaved shoulder to fix my wheel. With blood dripping down my leg, I struggled to pull the tire off. And I mean STRUGGLED! It just wouldn’t budge. I ended up using a piece of natural desert garbage I found road-side to dig under the tire to lift off a small section, then muscled the remaining tube off the rim. After I stretched my spare tire on, I proceeded to waste two of my precious three CO2 cartridges by trying to fill the fire using the right-angle valve adapter used to fit the CO2 nozzle into the small hole in the side of my Zipp carbon disc wheel. The pressure form the CO2 kept blowing the adapter off the nozzle! ARGH!!! This was really frustrating. I have practiced this before and have not had a problem, but that was probably with a slightly different CO2 inflator. This particular model would not grip the 90 degree elbow. I jammed the third CO2 nozzle into directly into the valve without the elbow and was able to inject about 90 psi into the tire. In so doing, though, I bent the valve cap slightly and this caused a slow leak. According to the SRM, I spent about 25 minutes messing around with the flat. 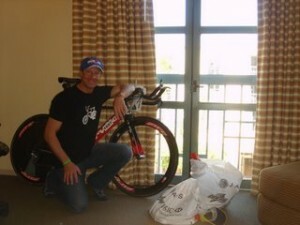 I mounted my Cervelo P3 carbon and took off again with the goal of trying to catch up to some of my buddies who had zipped past me while I was struggling with my tire – Greg Bradley, Matt Hoffman, Mike Gorman and Bernard were a few local Calgary triathletes who were also doing the race. I ended up catching Matt during the 3rd and final lap, but by then I was really starting to slow down. My rear tire was almost flat again, as I could feel even the smallest bump bottom out against my carbon rim. My 220 watt effort wasn’t producing nearly as much speed as compared to the other cyclists I was passing, so I knew I had to fix the problem. I wasted another 10 minutes or so riding on this soft flat looking for a support van to get a pump from. Finally I found a support guy and pulled over asking him for a CO2. He quickly produced a fresh cartridge for me and I re-filled my tire to about 100 psi – good enough to get me to the finish line. I ended up putting in a 5:38 bike split was was good enough for 21st position in my division. Here is where I start playing the WOULDHAVE game. I WOULDHAVE finished in just under 5 hours if not for the flats. My watts average was 208 watts for the first lap, 209 watts for the second and 181 watts for the third ending in 198 watt total average for the whole bike race. 198 watts of power over 180 km (112 miles) is about 4 hours, 55 minutes for me and my P3. Believe it or not, the fastest bike split in my 45 to 50 year old division was 5:21 !!!!! I WOULDHAVE had a 20 minute lead on my competitors in the marathon. Anyhow – lets not dwell. My swim wasn’t that great. I felt like I was having a great swim, but exited the water in an hour 16 minutes which is 2 minutes slower than last year. You know all about the bike, so I’ll stop going on about that. My run was mostly un-fun. A fairly slow 4 hours, 5 minutes. I felt great coming off the bike – for the first time I was able to run without any foot pain so I thought I was going to have a great run. I think I started to slow down after the 2nd of 3 laps of the 26.2 mile marathon course. I’m not sure my heart was fully into pushing through the misery. It was very hot and VERY windy. In order to really push the run, you need to be in perfect mental shape. I had done the mental math and figured that there was no way I could win a Hawaii qualifying slot after the bike fiasco, so I sort of checked out. Also for some reason my chest was really getting sore. The winds were especially high that day, and there was quite a bit of dust being blown about. I was starting to cough a during the run which was sort of concerning. I spoke with many triathletes after the race who reported the same symptoms during the run and the next few days after the race. I figure it was due to either the pollution (Phoenix is now the THIRD largest city in the US and there was a high pollution advisory on the days leading up to Ironman) or the dust storm. My finish time was 11:06 which was good for 16th place out of 203 guys in my age group (top 7.8%). The last Ironman World Championship qualifying slot went to the 8th place finisher with a finish time of 10:41 – only 25 minutes faster than me. I feel good knowing that I WOULDHAVE qualified easily if not for the flat tire. But as everything in life, you can’t blame anyone but yourself. I know that. It was my own negligence that resulted in 35 minutes of wasted time during the bike – I had not properly prepared for that and I have learned my lesson. A while ago I looked into a new product by Vittoria called PitStop. This is a compressed air canister that seals and fills flat tubular tires without having to remove the tube. You could theoretically fix a flat in under a minute. When I first heard about it, I tried to get some, but no US mail order bike supply company would ship the compressed air to Canada and it was not yet available here in Calgary. 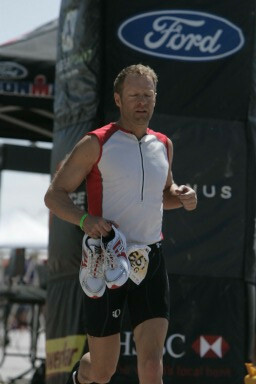 My next race is Ironman Canada on August 25th, so I will try to get some before then to experiment with. I am looking forward to giving this another shot at Ironman Canada. It’s my favorite Ironman race and I know a ton of people who will be racing, so it should be a lot of fun. I’ll be in great shape by the end of the summer, and I WILL BE PREPARED for a flat this time. I vow to break 3:45 on the run, 5:15 on the bike (IMC is a tougher bike course), and 1:15 on the swim. That should get me a Hawaii slot for world championships in October! gratuitous injury shots: black toes from the marathon, wet suit chaffing because the neck came undone during the swim and the Velcro sanded down my neck, and my tri jersey was rubbing on my underarm and carved off some skin. I am looking forward to a GREAT summer and I hope yours is equally as great! Greg WOULDHAVE K, and support team Helen.